Closed, the Flemish virginal looks like nothing so much as an elongated linen closet. Open, the visual effect is striking. The keyboard is surrounded by decorative block printed papers of the sort the Ruckers would have used. These papers also cover the front of the case and line the inside of the fallboard as well as the case above the soundboard, and the interior of the lid. The possibility of adding mottoes to the lid and fallboard, and painting figures of flowers and birds on the soundboard should not be overlooked. Although sober, even somber, with the lid down and the fallboard up, the effect sought by the old makers was a riot of color and detail when the instruments were open to be played. 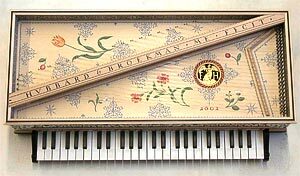 Flemish virginals emerged in the 17th century as two distinct instruments depending on which side of the front of the instrument the keyboard was located. Those with keyboard positioned to the right were known as muselars (above). These instruments, by plucking the strings close to their center points, produced a round, fluty sound of unusual power. 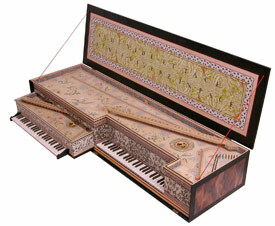 The spinet, whose keyboard lies to the left of the center (left), produces a sound approaching that of the wing-shaped harpsichord of the period. (Sound samples.) Explained simply, with the keyboard to the left, the spinet's jacks pluck the strings at points similar to those that would have been found in an instrument with a bentside. The ottavino or "child" is a diminutive spinet virginal whose construction generally parallels that of its larger relative. The main difference lies in the fact that, rather than being recessed, the keyboard of the ottavino projects between two scrolls from one of the long sides of the virginal. It is made without a lid, has a moulding of its own size that runs completely around the top of its four straight sides, and is intended to be covered with block printed papers all around. 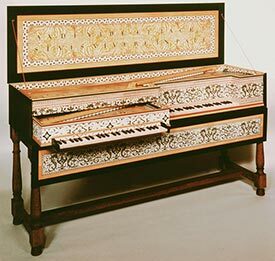 As its name would imply, the ottavino is pitched one octave higher than either the spinet or muselar or, in the parlance, at four-foot pitch (photo, below). It stores easily in the body of the large virginal, hence the term from the old Flamands, "Mother and Child." It can be played either by itself on a table, or, if placed atop the large virginal from which the jack rail has been removed, it may be played from the lower instrument's keyboard. In the latter case, one is playing a double-manual virginal disposed 1 x 8', 1 x 4' on the lower manual and 1 x 4' on the upper. The only manner of uncoupling the two instruments is to lift the ottavino off its mother and replace the mother's jack rail. Not all mp3 files are equal! 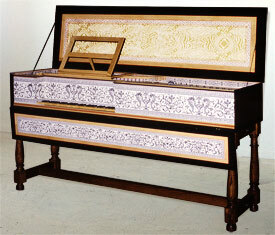 The sound of a harpsichord is particularly difficult to compress satisfactorily. The bit rate we have chosen for these samples is the lowest that reproduces the original recording with negligible loss. Download times will vary widely depending on your setup and the quality of your connection. On a 28K Internet connection, the shorter sound sample may take from about 5 to over 10 minutes to download. If you have a fast connection (T1, cable modem, DSL) please try the long sample - you may expect download times substantially under a minute. If you cannot play the file through your web browser, PC users with the Microsoft browser can right click on the link, then choose the "Save target" option to download the file, then use an MP3 player (or a the Windows media player) to listen to it. We now have available two demonstration CDs of the Flemish Mother and Child virginals. The first, recorded in analog stereo in 1982, documents both muselar & spinet types. The second CD, recorded digitally in 2003, is devoted solely to the Muselar. (Each CD is $10.00 ppd. in U.S.). Please -inquire via our contact form.